The last time I was in Washington DC, I was 12 years old. Even then I was a history geek and remember the chills when I first entered the Lincoln Memorial. I remember standing in front of the Gettysburg Address. I read it out loud, unafraid if anyone thought I was crazy. It was the first time I read it, and I was in awe. Now I am 34, and last night when I walked into the Lincoln Memorial, the chills came back. I stood in front of those words and read them aloud again. Tears rolled down my cheeks. My giant head makes it hard to see Abe, but I’m using a pretty old camera phone. I’m in Washington DC for the 2012 Young Clergy Leadership Forum hosted by the General Board of Church and Society. It is an awesome privilege to be here among 51 other clergy from over 30 Annual Conferences. I’ve already met some terrific people. I got into Washington yesterday afternoon and spent about four hours just walking around the mall. I think my goosebumps tally was four, and my tears came twice. I think the most emotional part of my night though, was when I approached the Martin Luther King memorial. It is set up so that as you come to it from the Lincoln Memorial, you have to walk in between a few huge stones. 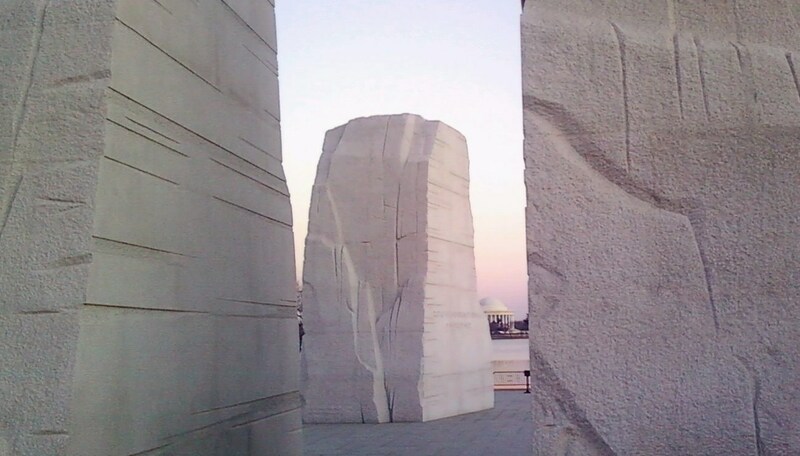 The opening between the stones is aligned with the Jefferson Memorial, creating a beautiful geographic juxtaposition. 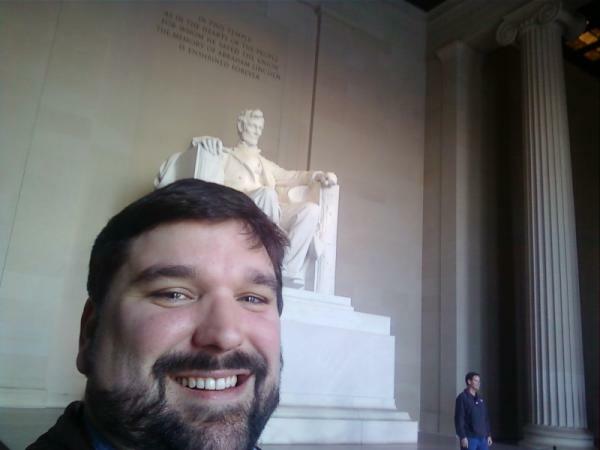 I stood with Lincoln, the man that helped save the Union, behind me and with Thomas Jefferson, the man that wrote “all men are created equal” directly in front of me. In between is the rock that reads “Out of the Mountain of Despair, a Stone of Hope.” It was quite powerful to think about the promises that were offered by Jefferson, the tragic work of Lincoln, and the dream of King. I paused and read some of King’s quotes that adorn the memorial. I sat by the water and pondered his dream. Surely there is much work to be done, but I am awestruck at how far we have come. The mountain of despair remains daunting, but the stone of hope is sure. All I can say after the last week of activity on The Fat Pastor is, “wow.” On November 15, I posted the blog called “Err on the Side of Grace.” My faceb0ok status that day told my 72 followers that the blog had just reached 70,000 views. A few days later I posted “Congratulations Coach,” my commentary on the Penn State tragedy. A few days later I sent that into a newspaper in hopes of being selected as their “Guest Sports Columnist,” a gig which would have given me a sports column every five weeks for an unknown amount of time. Then one night I decided to create a picture. I worked on it for a few hours. I agonized over the wording of it (I had about four different versions before going with the Micah 6:8 version). I posted it, shared it and then something amazing happened. In the 12 days since posting it, over 68,000 people have come to The Fat Pastor. It took one day for December 2011 to be the second busiest month on this blog. In this short time period I’ve added over 800 FB fans and 125 email subscribers. The picture I created has been shared 837 times. So now I have this new following, and I can’t help but think, “I’ve written some good stuff before that picture.” It also kind of bothers me that the most popular blog I’ve ever written “Happy Holidays,” is also the sharpest, angriest blog I’ve ever written. I’ve written 197 other blogs, and some of them (I think) have been pretty good. So this post is for all the new followers. Consider it my “Greatet Hits.” They might not be the most popular blogs I’ve written, but they are a few that tell the full story of what this site is all about. And it Was Still Hot – Where the Wild Things Are was my favorite book as a boy, and this was my reflection about the movie before it was released. Doug Rees – My wife and I saw Doug in a very intimate concert, and had a great time. It was a night of great music, and the beginning of a friendship. Come to the feast – What does it mean to “do this in remembrance of me”? Translators Needed – To speak the gospel to a new generation, we need to know the language. Someone posed this question to me – “Why do you call yourself the Fat Pastor?” Well, I have a few reasons. First of all, because I am a pastor. A lot of what I do on this blog is write about God and the Church. I offer my thoughts, or what I have called “my nebulous theology.” As a pastor, I am interested in sharing God’s message of love, redemption and grace. I think there is a lot of noise out there that contributes to a lot of confused people. I try to offer my view of God because, in my boldness, I think it might be helpful. Since starting this blog, I have been given much encouragement from people that have received gifts from my words to know that I indeed have something to offer. I’ve had about 40,000 views, and get about 50-100 a day. This is not a huge site, but some people tell me they like it. So right away, in the title of my blog, people know that I am coming from a pastoral perspective. I am, and always will be, a pastor. I am many other things too, and I write about the many things I enjoy. But one thing I am is overweight. It’s a fact that I cannot ignore. Every time I try to put on a tie, every time I tie my shoes, every time I get out of breath after light exertion, I am reminded of this fact. 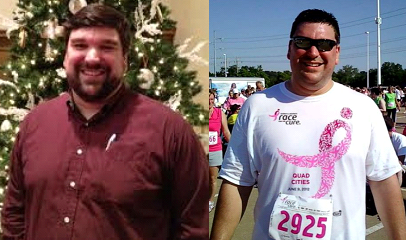 I am 6′ 2″, and at my last weigh-in, I’m 320 pounds. That’s grossly overweight. I named this blog in 2008 when I was shocked to find out my weight had topped 300 pounds, and it has generally gone the wrong way ever since. I’ve always been big. I was never the “fat kid” growing up, but I don’t think anyone has ever described me as skinny. I’m athletic, and actually healthy in a lot of ways, but my belly is certainly bigger than it should be. 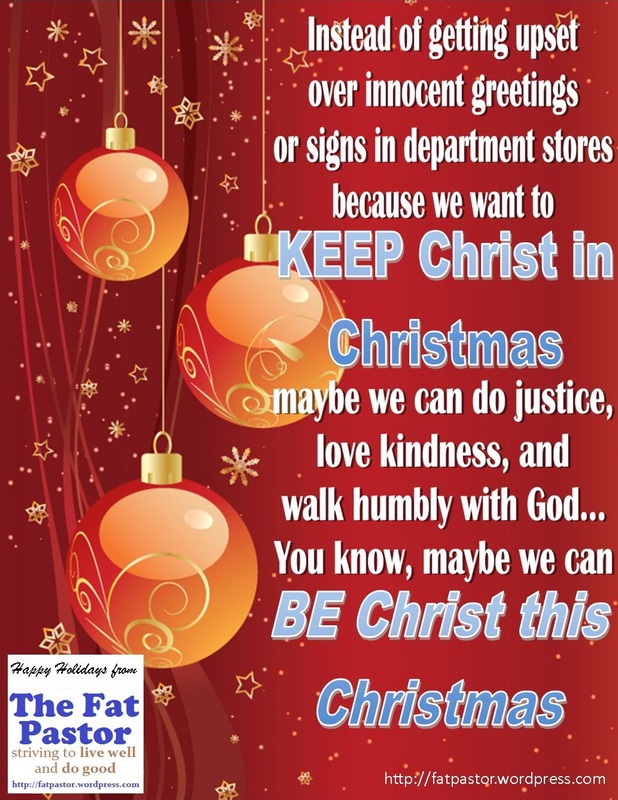 I call myself the Fat Pastor on this blog first and foremost because its true. But I also use the word “Fat” to try and breathe a little brevity into what I am doing. I have always had a self-depricating sense of humor. People tend to think of pastors in one of two ways. Some have an automatic sense of distrust. This is something that we, as pastors, have earned well. There are far too many of us that abuse our authority, and misuse the trust we are given. There are also people that tend to think of pastors as almost otherworldly. By calling myself the Fat Pastor, I am attempting to diffuse either extreme. I’m just a regular guy. I have struggles. I sin. I have a sense of humor. I like sports – perhaps too much. I like eating – definately way too much. I like beer and wine and scotch, but not in excess. I like some vulgar music and raunchy comedies and dirty jokes. I am not perfect. I’m fat. I don’t want to be, but I am. I don’t work out nearly as much as I should, and I eat way more than I ought. It doesn’t make me a bad person. Does it make me a hypocrite? Some would say so. But I am who I am. I want to be better, and I’m striving to live well and do good in the world. I am gifted. I have failures. I am a sinner. I am a saint. It’s who I am. And I would bet it is who you are too. I am the Fat Pastor. This is my blog. I hope you like it. If you do, share it with others. If you don’t, I’ll love you anyway. For an update on how I’m trying to change, check out the #Fat2Fit page.